The Hungarian government’s recently adopted legislation alters the conditions for the operation of foreign universities in Hungary. The highly controversial amendment, which triggered mass protests and international outrage, has become widely known as Lex CEU, since many of its clauses seem to specifically target CEU, the Central European University, creating a situation of existential instability there. 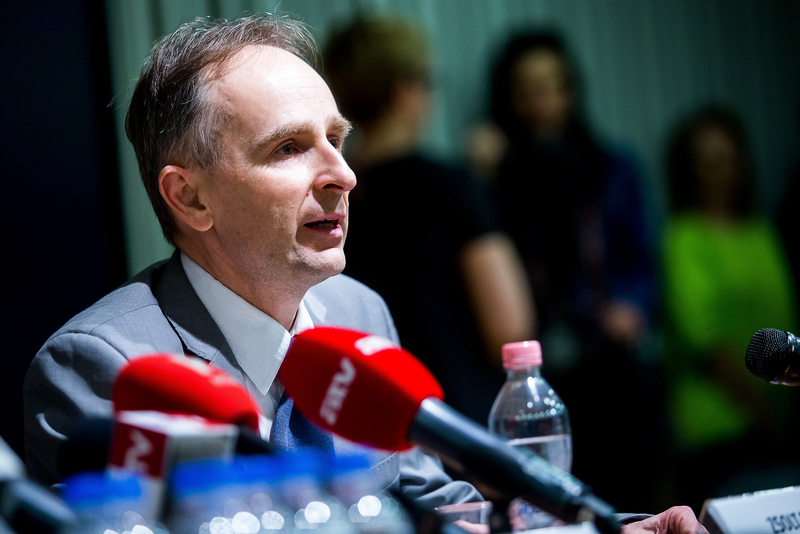 Anna Frenyó spoke with Zsolt Enyedi, the university’s Pro-Rector for Hungarian Affairs about the latest developments. Anna Frenyó: Peruvian author and Nobel laureate in literature Mario Vargas Llosa recently spoke at CEU’s “Academic Freedom – The Global Challenge” conference as an expression of support for CEU. Has the extensive backing that you have received from civil society and academia in Hungary and around the world helped you reaffirm your position? Zsolt Enyedi, CEU Pro-Rector for Hungarian Affairs: Definitely. The government has underestimated our international prestige. They tried to treat us like a little phantom university, yet there are tens of thousands of academics from all over the world that have expressed their solidarity with us. Mr Vargas Llosa compared the attack against CEU to what the liberal philosopher Karl Popper called the temptation of the tribe to regress to a primitive society, in which everyone shares a language and customs. This regression is driven by fear of globalisation and the opening of borders. According to Mr Vargas Llosa, this tribal temptation is behind the Hungarian government’s conspiracy to close CEU. Was this really a conspiracy? Well, as Mr Vargas Llosa indicated, the government didn’t like what the institution was doing: training very good professionals, but also democratic citizens with an alert and critical spirit. This, he said, is perceived as a threat by a populist government. He explained the enormous international encouragement CEU has received by asserting that the future of Europe is at stake – in the face of the peril of regression to old times, to a closed society. He expressed certainty that if this attack against CEU could be defeated, there were good chances of winning the war against nationalism, populism and all the enemies of cultural freedom. Do you share his optimism? Yes. For the Hungarian government, the rational strategy under the current circumstances is to accept CEU’s continued presence in Budapest. At the same time, the experience of the last two months is not particularly encouraging. In Hungary, important matters are decided at the highest level – they depend on the decision of that one person. What are the most difficult requirements of Lex CEU? CEU could only continue operating if there is a bilateral international agreement concluded by the Hungarian government and the State of New York. Moreover, this agreement must be preceded by a prior agreement with the Trump administration by 11 October 2017. Under the U.S. Constitution, however, it is the states which assume the responsibility for education – not the federal government – which makes the latter requirement impossible to fulfil. Insisting on this clause would eliminate other American higher education institutions operating in Hungary as collateral damage, such as the 150-year-old McDaniel College, which runs a fully-fledged programme in Budapest. McDaniel College Budapest has a draft bilateral agreement with the State of Maryland and a campus there, but no agreement at the federal level. How could Prime Minister Orbán have thought that the Republican administration would be supportive? Many analysts suppose that he may have had foreign policy objectives in mind with this attack against CEU. Orbán may have been hoping to put himself into a strategic position vis-à-vis the U.S. and Russia, as President Putin’s drastic measures against NGOs resonate with him. He also may have thought that he and President Trump share a common enemy in George Soros, CEU’s founder and a generous donor to Hillary Clinton. Lex CEU also requires that CEU have a U.S. campus, which it has never had in its 26-year history. …and that this campus should be up and running by 1 January 2018, which is nearly impossible. We asked government representatives whether it would be sufficient to launch a course in New York, but we received no clear answer. It turns out that they themselves hadn’t yet determined what exactly it was they were demanding of us. They said we were the educators, so we should know what “educational activity” meant. How cynical. This reminds me of Kafka’s The Trial. Yes. The format of our meeting with the government’s working group evoked similar associations. Fourteen state officials attended the meeting – not the best format for a substantive negotiation. Currently, there are several channels of communication regarding CEU, but we have no control over any of them. First, the European Commission has taken the first steps towards launching an infringement procedure against Hungary, criticising the perceived targeting of CEU. Second, the European Parliament has passed a resolution calling for the repeal of Lex CEU. Notwithstanding, the Hungarian government has refused to comply with this request, stating that it would not yield to political pressure. Third, the Venice Commission of the Council of Europe will issue an opinion on the legislation’s legality by October. And we’re also waiting for the Hungarian Constitutional Court’s ruling; they’ve set up an ad-hoc group to review the law. Finally, two and a half months after passing the new law, Kristóf Altusz, the prime minister’s negotiator in charge of talks, will now meet with the staff of the Governor of the State of New York, Andrew M. Cuomo, who had earlier announced his readiness to enter into discussions. How can you plan your courses beginning in September? What can you tell your students and faculty members? We are counting on continuing with business as usual to the extent possible in this abnormal situation. Nevertheless, by the beginning of September we should start promoting the 2018-2019 academic year. Consequently, we will need to know for sure by then whether CEU will have permission to continue operating in Budapest. Are you considering leaving Budapest if there is not a positive resolution? We have received many invitations from other European cities, for which we are truly grateful. However, even if we were forced to leave Hungary, we would want to come back as soon as possible. Budapest is our home – this is where our university is based. What is the atmosphere like among the university staff? Some are very enthusiastic and say we should fight till the end. They even feel inspired by the situation, as it demonstrates that our work is really worthwhile. Others need job security and wonder how this could ever be guaranteed under the present circumstances. Have any staff members decided to leave the university? No, but a few prospective students whose applications we had accepted subsequently informed us that due to the present situation they wouldn’t start their studies with us in September 2017. The overall numbers are promising, however; we can count on as many students as in the past. A year ahead of the general elections, the government needed a new enemy, which is civil society and its prominent icon, George Soros. Apart from the protests, is there any further cooperation between CEU and the organisations impacted by the NGO law requiring that “foreign-funded NGOs” register as such and publicly promote the fact that they receive funding from abroad? The sympathy is mutual, but our primary functions are different and the current situations are different too. The reasons behind these two attacks are obviously the same, yet the possible outcomes are different: we have to close down if the law comes into effect, whereas the NGOs can stay, although they will be labelled. The Constitutional Court and the Venice Commission are evaluating both cases. Certain right-wing ideologues characterise the NGOs and the university as parts of a general “international conspiracy”. Many people believe the prime minister wants to win the upcoming elections by presenting himself as a sovereign leader who fights against international pressure. In contrast, former German President Joachim Gauck gave a speech at CEU’s graduation ceremony on Friday, 23 June. He spoke about a united Europe which values freedom and openness. His presence symbolised the essence of CEU, indeed. He received the Open Society Prize, which honours his contribution to free societies and his decisive role in the transition in East Germany from tyranny to freedom. Our university was founded in 1991 with the goal of supporting the same democratic transitions in Central and Eastern Europe and the former Soviet Union. We hope that this spirit of freedom and democracy will live on. This is our credo. On Tuesday, 13 June, Hungary’s National Assembly passed a law that requires NGOs which receive foreign funds above the annual threshold of 24000 EUR to register and label themselves as “foreign-funded organisations” on their websites and in their publications.